With beautiful small ports, traditional villages with wonderful cobbled alleys, picturesque churches and gorgeous beaches, the Messinian or Outer Mani, a place with "heavy" historical heritage, captivates even the most demanding visitor! The most cosmopolitan areas are those of Kardamyli and Stoupa. Kardamyli is a beautiful seaside village, built in a sheltered bay on the foot of Taygetos Mountain. The majestic cypresses, the endless olive groves along with the beautiful beaches with their pebbly shores and crystal waters are harmoniously combined with the cobblestone alleys, the lofty towers and the tiled roof stone houses. In Kardamyli you will find seaside taverns within green yards and atmospheric bars, which will relax you with the sounds of jazz and classical music. Kardamyli makes an ideal destination for those, who love hiking, as from there begins the famous Vyros canyon, with marked trails, passing through picturesque byzantine little churches. During your stay in the area, do not miss out visiting the atmospheric Old Kardamyli. The reconstructed castles and chateaus promise a magical journey through time! 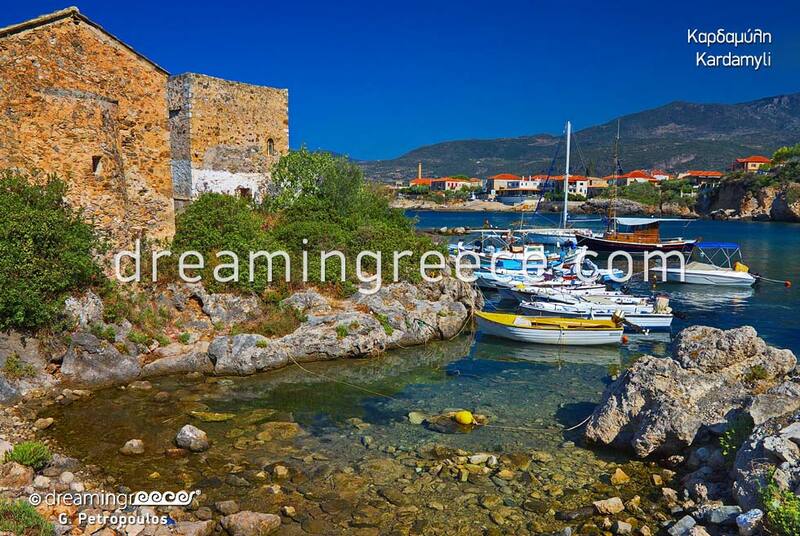 Near Kardamyli lies Stoupa, a charming seaside village, also built at the foot of Taygetos Mountain. The once quiet fishing village has now become a popular tourist resort, providing all comforts. On the eastern side of the village, stands the Beaufort Castle, which once was the citadel of the old state of Lefktro. In both Kardamili and Stoupa villages, the mountain “blends” harmoniously with the sea, creating a "corner" of unparalleled natural beauty that charms the traveler, all year round! Stoupa and Kardamyli are wetted by the Messinian Gulf and offer some of the finest beaches in Peloponnese! At the entrance of Kardamyli, lies the beach of Ritsa, with white pebbles. Following the road to Stoupa, you will find the beautiful, small beach of Kalamitsi as well as the majestic Fonias beach. The white pebbles, the turquoise waters and the majestic cliffs that dominate this beach compose a landscape of heavenly beauty! Between Kardamili and Stoupa lies the beach of Delfinia (Dolphins), with sand and fine pebbles. Stoupa has three beaches. The first one is the long, sandy beach of Stoupa, which lies directly in front of the village. In the southern part of the village lies the secluded pebbly beach of Halikoura, whereas at the northern edge of Stoupa, you will find the beautiful Kalogria beach, with golden sand and turquoise waters. At the southern tip of Kalogria, Kazantzakis’ Cave lies. You can visit it either swimming or by boat! If you stay on the beach until late, you will see the sun setting into the water, "painting" the sea pink! This is one of the most idyllic sunsets in Greece! To reach Kardamyli or Stoupa you can drive from Athens via the National Highway from Corinth to Tripoli (approximately 3 hours ride). Then you will take the new National Highway from Tripoli to Kalamata, heading to Kalamata. When you reach the beach of Kalamata, take the coastal road following the signs to Kardamyli or Stoupa. These two destinations are approximately 30 - 40 minutes away from Kalamata (the route has many turns). To reach Kardamyli or Stoupa you can drive from Patras via the National Highway from Patras to Pyrgos (250 km distance - approximately 4 hours ride). Take the road from Pyrgos to Kyparissia heading for Kalamata. After passing Kalamata, follow the signs to Stoupa and Kardamyli.